The Flash had a great year in its first season, debuting as the second-highest rated premiere in network history and continuing with universally positive reception throughout its run. 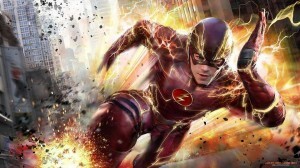 It’s a show that’s redefined fun for superheroes, and as such, it’s loads of fun to talk about it. So, we’re going to talk about it. Roundtables for Arrow with Team GATV have been going on since its first season, where the staff and guest contributors look back at the best and worst of the season and look forward to the future. Now that the Arrow universe has expanded, it only makes sense to delve into its hugely successful spin-off in similar in-depth fashion. Opinions are honest and frank, and we don’t hold much back — but with multiple contributors, the views are also varied and hopefully diverse. Participating in this year’s roundtable: Craig Byrne, webmaster of FlashTVNews and the KSiteTV Network; Derek B. Gayle, writer of the weekly recaps and reviews of The Flash and Vixen; Matt Tucker, resident Arrow reviewer over on GreenArrowTV; and KSiteTV reviewer Stephanie Hall. Today, we’re going to look back at the premiere season. Later this week, we’ll share our spoilery thoughts about what’s to come in part two — all in time for the premiere next Tuesday! Keep in mind, this article is split over many pages, so be sure to navigate when you see that as an option! What’s your general opinion of The Flash‘s first season? 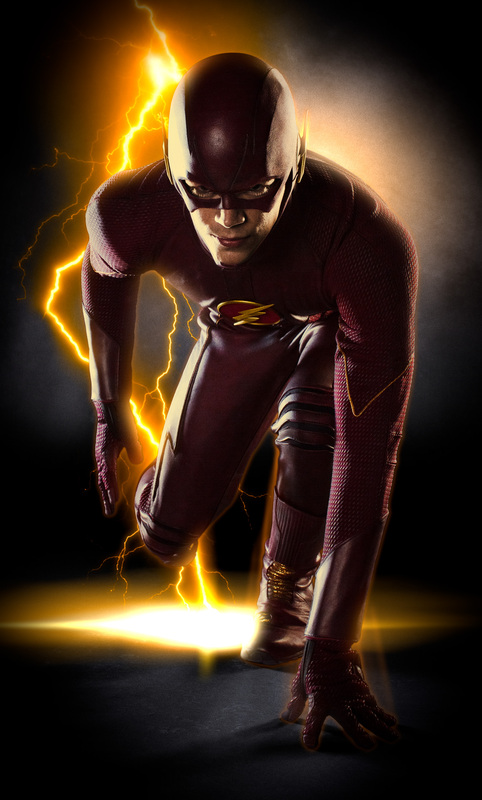 What was also great about The Flash, for me, is that the show brought us such a likable hero in Grant Gustin’s Barry Allen. Here’s a guy who has been through a lot of stuff yet still puts a smile on his face at the end of the day. He does right because it’s the right thing to do. Even before he had his powers, he wanted to do the right thing. That’s great. All of this is wrapped into a continuing narrative with characters like Harrison Wells keeping the questions coming. And the show gives us so many talented actors and characters. I can’t say enough good things about this first season. DEREK: It’s my favorite show I’ve watched this year. It hits a really specific sweet spot — a colorful, optimistic, fun superhero show with heavy science fiction, but one that still has high stakes and smart storytelling. 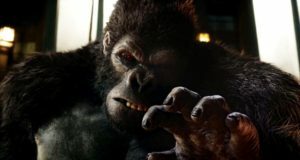 It’s the tone I enjoy in Marvel movies and latter-day Smallville, but with more consistent writing and room to breathe over a long-term narrative. 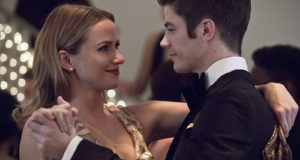 STEPHANIE: I’ve been generally impressed with The Flash’s first season, especially the way it can tell a standalone story in the same episode that it can give you all sorts of answers about Harrison Wells that you’ve been dying to know for months. I like that it fits in between the worlds of Arrow and early Smallville. 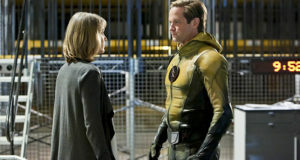 MATT: To be frank, the show owns the superhero genre on television. And honestly, I think everyone knows it. (Marvel and Netflix’s Daredevil, though, currently wears the crown for the street vigilante subset of the genre.) There are certainly some “CW” aspects to the series, but this had some crossover appeal that even Arrow couldn’t drum up. That got people to tune in who would normally ignore anything on the network because of its general focus or their preconceived notions of it. What’s great, though, is that everyone was rewarded for giving it a watch. So many great points being made here. I love how close Flash sticks to the spirit of the comics, and the episodes where they parallel the personal relationships to the scifi elements are golden. I’m also so happy that Iris knows the truth now and can be integrated into the main plot. I feel like Westallen as the romantic backbone of the story can only get better from here, but like you said, it doesn’t overwhelm the plot of the story which is so important. Personally speaking, now that Iris knows what’s up, I think there’s nothing stopping that if that’s where they want to go… obviously being The Flash, it’ll happen eventually. This was a great round table. It’s awesome to see everyone’s opinions laid out. I’m all about Barry and his relationships with the Wests, so my favorite episodes are the usuals: 1.09, 1.15, 1.20, 1.21, 1.23. 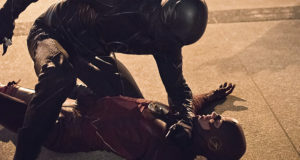 But if I had to pick an underrated episode… I know the crossover in 1.08 isn’t that exactly, but I think it was the best use of Arrow characters in The Flash all season long. The two worlds clashed beautifully and seeing some of Barry’s subconscious resentments (against Joe for ‘imprisoning’ Henry and against Eddie for ‘stealing’ Iris) was both enlightening and shocking. Even though his anger was unfair, of course, it helped to make him more well-rounded. There was a point where Arrow got three weeks ahead of the Flash. The episode when Oliver joined the League of Assassins they did a three week time skip because Oliver was training.